Lately my knitting needles have been occupied with...doll clothes! Very tiny doll clothes. These three little dolls (each modeled after a member of our family) were some of the travel toys that I packed along for Sister Stinky last week. They have taken more work than I anticipated (the Daddy doll is still in need of some clothes, which is what is cast on to my needles right now!) but they have been MUCH loved by the little girl. Not surprisingly, the Mommy doll is the one she wants to take everywhere with her...hmmm..sound familiar? The dolls are modeled after a cute little family of Waldorf style dolls I found on Etsy. Needless to say, these were much more affordable for us! I don't necessarily ascribe to the Waldorf style of learning but I have a very soft place in my heart for their adorable dolls! While we were visiting family I started the very long but very absorbing Kristin Lavransdatter. My dear mother-in-law has been trying to get me to read this Norwegian tale for the past year and even lent me her copy. She assured me that I once I started it, I'd be hooked. She was right! 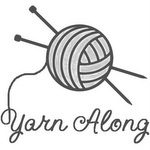 Linking up to Ginny's yarn along! You are SO smart. Wayyy better to knit such tiny items!! I remember my mom telling me that she would never sew me barbie clothes, because she used to do that for herself and it was miserable. Frankly, it sounds like such a tediously horrible task I was surprised to hear that ANYONE sews their own Barbie clothes! !